Therefore, the search for natural products with antifungal activity of agronomic relevance is an important alternative for the control of diseases such as anthracnose.9 In the search for bioactive compounds, only a small fraction of the estimated fungal biodiversity has been chemically investigated,10 and only a small number of these have already been cultured and selected for drug production.11,12 Fungi have special interest because they are known to produce several secondary metabolites with a wide range of applications.13 The fungi of the genus Xylaria stand out in the production of secondary metabolites, mainly of the class of cytochalasins, isocumarins, lactones, sesquiterpenos, triterpenos and xanthones, and with the most diverse biological activities, such as anticancer, antioxidant, antimicrobial, antiinflammatory, antiviral, inhibiting HIV-1 protease, antibiotic and antitumor,14,15 among others. In a previous study, a screening was done with the fractions of 16 endophytic fungi isolated from Guarana plant from Amazonia, and two Xylaria spp. were selected because its activity against the phytopathogen Colletotrichum gloeosporioides. Thus, this research aimed to evaluate the antifungal potential of secondary metabolites produced by this two endophytic Xylaria spp. isolated from guarana (P. cupana). Optical rotations were taken on a Polartronic H Schmidt & Haensch digital polarimeter (1dm cell) at 23°C. The 1H nuclear magnetic resonance (NMR) was recorded on a Bruker 14.1Tesla, AVANCE III model spectrometer (operating at 600.13MHz for hydrogen frequency) with crioprobe™. The chemical shifts are given on a δ (ppm) scale and referenced to tetramethylsilane (TMS). High-resolution electrospray ionization mass spectrometry (HR-ESI MS) was acquired by direct infusion on a Q-TOF Maxis Impact in the following conditions: capillary voltage, 4.50kV; operating in electrospray positive mode; The ion source was set to a nebulizer pressure of 0.3bar, a dry gas flow rate of 4Lmin−1, and a dry temperature of 180°C; detection range: 100–700Da with total ion count extracting acquisition. Data acquisition was performed using a Bruker Compass Data Analysis 4.2. High-performance liquid chromatography (HPLC) was conducted using a Agilent 1100 Series UV/Vis with a quaternary pump, coupled to a UV detector MWD (Multiple Wavelength Detector), using a reversed phase column C18 (250mm×4.60mm, 5μm; Phenomenex Kinetex), with a mobile phase H2O/MeOH (80:20, v/v), flow rate 1mLmin−1 and λ=254nm. HPLC-grade solvents were utilized. Solid-phase extraction was carried out using silica gel cartridges of different dimensions (Phenomenex). Gel permeation chromatography was performed in a glass column filled with Sephadex LH-20 (Pharmacia). Silica gel254 (Macherey-Nagel) were used for thin-layer chromatography (TLC). Spots were detected under UV light (254 and 365nm). Pure culture of isolates 249 and 214 were first grown in malt agar 2% (in gL−1: 20 malt extract, and 15 agar, Acumedia, Neogen™) at 25°C for seven days. Then, fresh mycelia were harvested from and used for DNA extraction based on the CTAB method (cetyltrimethyl ammonium bromide) used in Montoya et al.19 We amplified the ITS barcoding region using ITS4 and ITS5 primers. Amplicons were cleaned up and submitted to cycle-sequencing reactions using BigDye Terminator v. 3.1 Kit (Thermo Fischer Scientific). Bidirectional sequences were generated in ABI 3530 (Thermo Fischer Scientific) using the same primer pair. Forward and reverse sequences were assembled in contigs in Bioedit.20 Then, contigs were compared with homologous sequences deposited in the NCBI-Genbank. To refine the taxonomic assignment of isolates 249 and 214, we carried out a phylogenetic analysis in MEGA v.6.0.21 For this analysis, we retrieved sequences from closet relative taxa deposited in the database. Sequences were aligned in MAFFT,22 and this dataset was used to infer a phylogenetic tree under the neighbor-joining algorithm and the Kimura 2-parameters as the nucleotide substitution model. Branch support was calculated using 1000 bootstrap pseudoreplicates. The endophytic fungi 249 and 214 were separately fermented in malt extract broth (in gL−1: 20 malt extract, Kasvi™, Brazil) at 27°C under agitation (150rpm) for five days (5L; 20mL×250mL batches in 500mL Erlenmeyer flasks, for each fungal strain). The mycelium was separated from the liquid extract using vacuum filtration (filter Macherey Nagel™, MN 640m, 7cm) and the liquid extract was extracted three times with EtOAc (100mL of the liquid extract to 150mL of EtOAc). Evaporation of the solvent from the extract in vacuo gave an EtOAc extract (306.4mg for the strain 249 and 700.0mg for the strain 214). The EtOAc extract from the strain 249 was chromatographed on a Sep-Pak silica gel column (5g, Waters™). The sample was solubilized in a mixture of hexane and CH2Cl2 (100μL) and applied to the top of the column, which was eluting successively hexane/CH2Cl2/MeOH, starting with 100mL of 100% hexane and increasing the gradient of CH2Cl2 until 100% CH2Cl2, and then increasing the gradient of MeOH until 100%. Based on the TLC monitoring, all the fractions collected were combined in six main fractions (a–f). Bioactive fraction d (221.4mg) was subjected to further CC fractionation over silica gel (5g) eluted with hexane/CH2Cl2/MeOH to give five fractions (d1–d5). Bioactive fraction d1 (105mg) was fractioned by gel filtration over Sephadex LH-20 column eluted with 100% MeOH to give five fractions (d1a–d1e), collected based on the retention time. Bioactive fraction d1b (44mg) was purified on reverse phase HPLC using an isocratic elution H2O/MeOH (80:20) during 25min to give four fractions (d1b1–d1b4), being the active d1b4 (retention time: 11.22min) with 6.8mg. The EtOAc extract from the strain 214 was chromatographed on a Sep-Pak silica gel column (10g, Waters®) eluting successively hexane/CH2Cl2/EtOAc/MeOH to give six fractions: 50mL hexane: 50mL CH2Cl2 (fraction a), 100mL CH2Cl2 (fraction b), 50mL CH2Cl2: 50mL EtOAc (fraction c), 100mL EtOAc (fraction d), 50mL EtOAc: 50mL MeOH (fraction e) and 100mL MeOH (fraction f). Bioactive fraction d (375mg), was subjected to further CC fractionation over silica gel (5g) the same way described above to give six fractions (d1–d6). Bioactive fraction d3 (50mL CH2Cl2: 50mL EtOAc, 171mg) was purified on reverse phase HPLC during 15min using an isocratic elution H2O/MeOH (80:20) to give three fractions (d3a–d3c), being the active d3c with retention time 5.92min (9.6mg). The disk-diffusion assay (paper disk method)23 was used to determine the antifungal activity during the separation and purification procedures. Each fraction obtained from different chromatographs was solubilized in MeOH and applied (10μL) to 6mm diameter sterile paper disks (with 2mg of each EtOAc extract, 1mg of each fraction or 0.5mg of each pure compound) and placed at one edge of the 60mm PDA Petri dish plate (Kasvi™, Brazil). An inoculum of the pathogen (a 7mm diameter disc removed from a new peaked plate) was added to another edge of the PDA plate. The clear inhibition zones of mycelial growth around the paper disks were measured after incubation for 7 days at 27°C. After this period, the inhibition percentages were calculated compared to the control using the analysis program Image J (Image Processing and Analysis in Java). This experiment was conducted with one repeat. For the negative control, 10μL of MeOH was applied in a sterile paper disk. In order to know the fungicidal or fungistatic action of the isolated compounds, a small part of the fungi next to the paper disk with each compound was transferred to a new plate. The action was characterized by fungicide if the fungus does not grow in the new plate, and fungistatic if growth. Colletotrichum gloeosporioides used in this study was ceded by the UFAM, Amazonas-AM, Brazil. This phytopatogenic fungal strain was isolated from Guarana leaves infected with anthracnose and is deposited in the Central de Recursos Microbianos da UNESP (CRM-UNESP) under the code CRM 1352. Broth microdilution techniques were performed in 96-well microplates according to the guidelines of the National Committee for Clinical Laboratory Standards24 with modifications. For the assay, compound test wells (CTWs) were prepared with stock solutions of each compound in DMSO (250mgmL−1), diluted with malt 2% medium (in gL−1: 20 malt extract, Kasvi, Brazil) to final of 250, 125, 62.5, 31.25, 15.6, 7.81, 3.90, 1.95, 0.77, 0.48 and 0.24μg per well. An inoculum suspension of C. gloeosporioides spores was obtained from a 14 days-old culture and was added into liquid malt 2% medium (105sporesmL−1, 60μL) to each well (final volume in the well=100μL, completed with liquid malt 2% medium). Spores were obtained through the fungal culture on solid malt 2% medium after 14 days. The plate was scraped, and sterile distilled water was added. This solution was filtered in sterile glass wool to separate the spores, and the counting of the spores was done in Neubauer chamber. A growth control well (containing medium, inoculum, and the highest concentration of DMSO used in a CTW, but compound-free) was included. Microplates were incubated in B.O.D. at 28°C and were read in a TECAN microplate reader, SUNRISE model, operated by the software Magellan v7.1, at 620nm, in intervals of 12h, for 144h. The active ingredients of commercial fungicides Captan™ (N-(trichloromethylthio)ciclohex-4-ene-1,2-dicarboximide) and Score™ (difenoconazole, cis-trans-3-chloro-4-[4-methyl-2-(1H-1,2,4-triazol-1-ylmethyl)-1,3-dioxolan-2-yl]phenyl 4-chlorophenyl ether) were used as positive control in the same concentrations of the isolated compounds. The MICs were determined spectrophotometrically after the above mentioned incubation periods, according to the NCCLS guidelines,24 with modifications. For commercial fungicides and compound, the MICs were determined as the lowest concentration showing absence or equal to the initial growth compared with the growth (until 12h) in the drug-free well. The strains 249 and 214 were isolated from the guarana leaves in the Amazon in two different places. 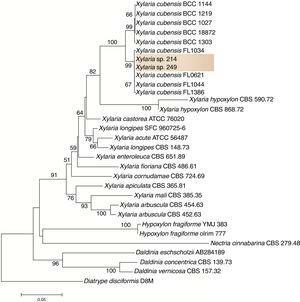 After purification of the strains and based on the phylogenetic analysis, the sequences of isolates 249 and 214 clustered with sequences from other Xylaria species with high bootstrap support. Thus, here we tentatively identified these fungi as Xylaria sp. (Fig. 1). The fungal strains are deposited at the Central de Recursos Microbianos da UNESP (CRM-UNESP) under codes CRM 1915 (Xylaria sp. 214) and CRM 1916 (Xylaria sp. 249). Phylogenetic tree of Xylaria spp. 249 and 214. The EtOAc extract (306mg) from the strain 249 showed 60.39% inhibition to C. gloeosporioides. This extract was fractionated by chromatography on a silica-gel column, permeation chromatography on Sephadex LH-20 gel and reverse phase HPLC. The active compound showed 51.33% activity (code d1b4, 6.8mg). The EtOAc extract (700mg) from the strain 214 showed 30.76% inhibition to C. gloeosporioides. This extract was fractionated by chromatography on a silica-gel column and reverse phase HPLC. The active compound (code d3c, 9.6mg) showed 38.76% inhibition to C. gloeosporioides. Structures of the piliformic acid (C11H18O4) (A) and cytochalasin D (C30H37NO6) (B) produced by Xylaria sp. 249 and Xylaria sp. 214, respectively, isolated from guarana plant. The experiment of optical rotation provided [α]D23 0.0192 (c, 1mgmL−1 in MeOH), consistent with the literature, allowing identify it as (+)-cytochalasin D (Fig. 2-B). The isolated compounds piliformic acid and cytochalasin D have fungistatic activity against C. gloeosporioides. Piliformic acid inhibited 51.33% of the mycelial growth of C. gloeosporioides by the disk diffusion method, and cytochalasin D 38.76%, both in a concentration of 500μgdisk−1. In the microdilution assay (Fig. 3) all the compounds showed antifungal activity. Captan and difenoconazole were included as positive controls (MIC of 16.63 and 0.02μmolmL−1, respectively). Piliformic acid and cytochalasin D were active against C. gloeosporioides, with a MIC of 2.92 and 2.46μmolmL−1, respectively. Both have a higher MIC than the active ingredient difenoconazole, but a lower MIC than captan. Commercial fungicides were chosen because they are from different chemical classes and presented distinct mechanisms of action. Data obtained in microdilution assay of the isolated compound piliformic acid (A) and cytochalasin D (B) against spores of C. gloeosporioides. The piliformic acid (CAS 98985-75-2), also known as 2-hexylidene-3-methylbutanedioic acid, 2-cyclohexylidene-3-methylsuccinic acid or 3-Nonene-2,3-dicarboxylic acid25 belongs to the chemical class of the polyketides.29 The biosynthesis of piliformic acid has been studied. The metabolite can be retro-biosynthetically cleaved to generate a C8 and a C3 moiety, and the C8 unit is derived directly from octanoate that originates from a fatty acid synthase (FAS) rather than from a polyketide synthase (PKS).26 The synthesis was already studied by Mangaleswaran and Argade,27 and it was an easy, four-step. Piliformic acid was identified the first time by Anderson et al.30 as a metabolite produced by fungi of the family Xylariaceae: Hypoxylon (H. deustum), Poronia (P. piliformis) and Xylaria (X. polymorpha, X. longipes, X. Mali and X. hypoxylon).26 This compound is commonly found in endophytic fungi belonging to the Xylariaceae, especially in the genus Xylaria. It was already isolated from the marine-derived fungus Xylaria sp. PSU-F10031 and also from an endophytic Xylaria sp. of Pinus strobus.32 This metabolite is also produced by others fungi, as several endophytic fungi isolated from the mangrove plant Avicennia marina33 and from an endophytic Aspergillus allahabadii BCC4533534 among others. The biological activities of cytochalasins include glucose transport, inhibition of the actin polymerization, secretion of hormones, immunosuppressive activity, antibiotic, antiviral, herbicidal and antifungal activity.49–53 The activity of cytochalasin D against five tumor cell lines have been tested, and the IC50 ranged from 0.22 to 1.44μM.43 In agronomy, as an antifungal agent, cytochalasin D has activity against the plant pathogen Botrytis cinerea, the causal agent of gray mold on plants, at a concentration of 25μgdisc−1, in a disk diffusion method bioassay.49 The cytochalasin D was also tested against C. cladosporioides and C. sphaerospermum, the causal agents of verrucose in plants, by the by bioautography method. It inhibited the plant pathogens in a concentration of 10 and 25μgmL−1, respectively.51 In our study, cytochalasin D was active against C. gloeosporioides with a MIC of 2.46μmolmL−1. In the literature, there are others compounds with activity against this plant pathogen, as preussomerin EG1 and its derivatives monoacetylpreussomerin and diacetylpreussomerin EG1, with MIC at 100μgmL−1 (0.28μmolmL−1) by dilution in agar (radial growth-inhibitory activity).54 In another study, the compounds cyclotryprostatin A and tryptoquivaline O were tested against C. gloeosporioides by microdilution test and showed MIC of 50μgmL−1 (0.12μmolmL−1) and 100μgmL−1 (0.18μmolmL−1), respectively.55 The compound dehydrozaluzanin exhibited activity at 30mM.56 The isolated compounds piliformic acid and cytochalasin D have MIC values of 2.92 and 2.46μmolmL−1. The isolated compounds acid piliformic and cytochalasin D we are founded to present promising antifungal activity against C. gloeosporioides (from guarana plant), which causes the anthracnose disease. These compounds were produced by endophytic Xylaria spp. (from Manaus and Maués), in the Amazonia Forest. Thus, it was possible to verify that both Xylaria species presented a biotechnological potential and production of different active compounds. The compounds isolated in the present work are here reported for the first time as antifungal agents against C. gloeosporioides, a relevant plant pathogen worldwide. However, toxicity tests and in vivo bioassays need to be performed. Financial support was provided by FAPESP grant (2014/15760-3) and BIOTA/BIOprospecTA FAPESP grant (2013/50228-8). Scholarships to L. M. Elias. (FAPESP: 2012/02000-5), M. C. Ferreira. (FAPESP: 2014/05940-4), from CNPq (142079/2016-2) and CAPES are also gratefully acknowledged. We thank UFAM, T. E. Bezerra, Dr. R. G. de S. Berlinck, Dr. M. W. Paixão and Dr. N. S. M. Junior. Bioactive sesquiterpenes produced by fungi: are they useful for humans as well? Sesquiterpenes and other constituents of Xylaria sp. NC1214, a fungal endophyte of the moss Hypnum spp.